I have a sheet with two filter views, which apply filter on one column and sort on another. The sheet is populated from the API nightly - it has all worked great but today I noticed things in the wrong views. 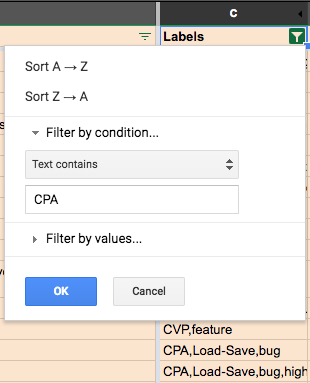 First issue - Labels column is filtered on containing "CPA" but you can see the one right under the popup is "CVP,feature". Second issue... Priority is sorted on value but the two new ones at the bottom are not being counted here. I've tried switching filter views, refreshing the page in my browser, even closing and reopening the document, but nothing. What is wrong and how do I fix this? Google Sheet's Filter Views only work on the range specified. This range does not update upon the adding of rows or columns. The second issue, the number not being sorted, is because of the first. Those cells are not in the range of the Fitler View. How to sort groups of rows in Google Sheets?